The title could not be more appropriate: Arduino Yún is in fact the first of a series of products that is already revolutionizing the world of Makers. I will not examine here the specifications (which have already been widely discussed in various blogs and which are summarized on the official website), but I would rather analyze the mode of operation of this platform, as well as highlight the possible future implications. The starting premise is that the Arduino environment has spread exponentially since its inception, becoming a de facto standard, fueling in a virtuous circle the worldwide Makers movement. From Arduino have resulted in fact hundreds of projects, similar board and new ideas, so that now are very few technological innovations that have nothing to do with this board (just think of the advent of 3D printers). Ad Arduino mancava però ancora una cosa, di importanza sempre più fondamentale per poter partecipare all’Internet dell Cose: la capacità di scambiare ed elaborare metadati complessi con il resto del mondo (utilizzando ad esempio il web semantico). The Arduino, however, still lacked one crucial thing to be able to participate in the Internet of Things: the ability to exchange and process complex metadata with the rest of the world (using for example the Semantic Web). This deficit the world of digital artisans tried to remedy, with more or less successful solutions usually based on the combination of Arduino with embedded linux systems, such as the Raspberry Pi, which are very web-oriented and prepared to data processing, but lack of physical connections with the real world (in my own small I also made a few attempts: see Ardudome). 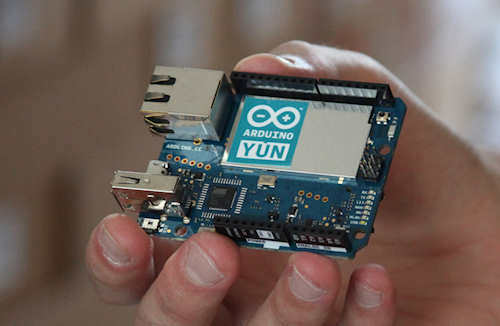 The makers of Arduino have responded to this ever more pressing need with a truly unique product: Arduino Yún. – The interaction with the widest range API (Google, Youtube, Twitter, etc.). But the feature that I think above all else is the hub of the whole operation, is the Bridge library, which is the software that allows these two worlds to communicate with each other in a simple and fast way. At first glance, reading the various examples, it all seemed quite incomprehensible, but using and experimenting with the library , you quickly realize the enormous potential and brilliance of this product: the connection between the two souls of the Yún is via a serial communication that allows a direct exchange of data in a bidirectional communication using simple dedicated functions. Therefore it is possible for example to directly access Arduino sensors data from the Linux side, or vice versa to access directly the output of a linux command from the Arduino side. This mode of communication simplifies everything and vastly expands the incredible potential of the old Arduino board, but also those of a “trivial” embedded linux board. For example we can very easily turn on an LED when we get an email, rather than monitor the power consumption of our house and save the data on a Google Spreadsheet document, or even build an alarm clock that according to traffic conditions retrieved from the Internet, decides whether it is early or too late to wake up. The practical implications of this technology are really futuristic and endless, and we can imagine that this library will be the engine of the next Arduino’s revolution: Arduino Tre, which promises extreme performance compared to Arduino Yún, especially with regard to the Linux side. Will in fact have more power, an HDMI output and will be based on the Beagleboard system. During these days I’m working on my first project which will be published as soon as completed.